Art is an exciting and enriching subject and, in the Art Department at Christleton, our students are challenged by a wide range of creative experiences. 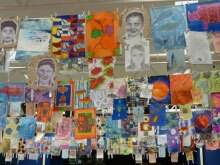 Learning in Art develops visual intelligence, two and three dimensional thought, and skills in independent learning. We are very pleased to offer opportunities in accelerated learning to students who are ready to meet the challenges of external examinations ahead of traditional expectations. In Years 7-9 students at Christleton have 2 hours of Art & Design per fortnight and study key themes including colour, architecture, the Renaissance, portraiture and cultural art and craft. Both effort and attainment are carefully rewarded, not least in sketchbook competitions and regular home learning awards. In Years 10 & 11 students have 5 hours of Art per fortnight in order to complete their GCSE course in Fine Art. In the case of very able students, an additional Art specification such as Photography may sometimes also be taken. At A Level, we offer Fine Art and Photography, and students have 10 hours of lessons per fortnight for these courses. GCSE and A Level students may participate in residential visits. 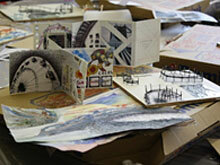 Our chosen examination board at all levels is AQA and, at GCSE and A Level, assessment in Art focuses on four areas. These are developing ideas, experimentation, making images and other forms of artwork in a variety of ways and, finally, responding personally to a topic, theme or idea. From Christleton, many students continue with Art and Design in various forms including Art Foundation and degrees in Fine Art, Fashion and Architecture. We are proud of the artistic progress made by of all of our students, whether in school or beyond school.